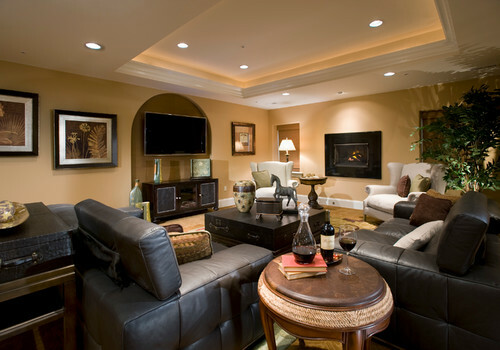 With the use of a remodelling recessed light housing, recessed lights can be mounted from underneath the ceiling so you won’t have to access the top of the ceiling and the ceiling joists from the attic. Here is your step-by-step guide to help you with this do-it-yourself lighting project. Switch off the power to the room at the main circuit breaker. Insert a circuit tester plug into an electrical outlet to check if it is safe to work. Hold the recessed light housing up against the ceiling where you want to install your new light fixture. Using a pencil, trace around the housing. Start cutting the hole out for the recessed light by drilling a 1/4-inch hole into the center of the traced area. Insert a key hole saw into the hole, cut towards the traced line, then cut on the traced line. Find a nearby junction box or electrical outlet to which your light switch and recessed light will be wired. Remove the face plate from the junction box or outlet. Remove the screws holding the outlet to the electrical box then carefully pull the outlet out of the electrical box to expose the wires. Locate the position of the light switch in the middle of the recessed light and the electrical outlet. Measure 52 inches up from the floor and mark this using a pencil. Trace the electrical box on the wall for the light switch, centered on the 52-inch mark. Drill a hole in the center of the traced area then cut out using a key hole saw. From the recessed light hole, run the electrical cable through the ceiling over to the light switch hole. Using a fish tape, pull the end of the cable out of the wall by 6 inches. Cut the cable using wire cutters. Also cut the end of the cable that is hanging from the recessed light hole in the ceiling about 6 inches long. Insert the electrical cable into the hole on the remodelling electrical box. Next, tuck the remodelling electrical box into the light switch hole and push it up so the clamps snap in place. Insert the electrical cable into the cable clamp on the remodelling recessed light housing. With a utility knife, cut off 3 inches from the outer insulation jacket of each end of the electrical cable to expose the internal insulated wires and bare copper grounding wire. Then strip 3/8 inch of the insulation off each wire using wire strippers. Hold the new black wire on its end and attach this to the black wire from the junction box, then twist them together. Secure the connection with a wire nut. Connect to an electrical outlet by wrapping the black wire counter clockwise around the brass-colored terminal screw. Fasten the screw using a screwdriver. Apply the same steps with the white wires. Twist the two bare copper grounding wires together, with the bare metal end of the green insulated pigtail wire. Then screw on the green wire nut and insert the screw of the pigtail into the screw hole on the junction box or electrical box. Repeat this step to ground the light switch wires. Wrap the black wire that stretches from the outlet or junction box up to the light switch electrical box around the brass-colored terminal screw on the light switch. Then wrap the white wire that leads to the outlet or junction box counter clockwise around the silver-colored terminal screw on the light switch, directly underneath the brass-colored terminal screw and on the same side at the brass-colored terminal screw. Twist the black wire that leads to the light switch and the black wire from the recessed light fixture together and fasten with a wire nut. Do the same with the light switch white wire and light fixture white wire. Wrap the green insulated wire or the bare copper grounding wire of the light switch around the green grounding screw of the light fixture then fasten the screw. Insert the remodel recessed light housing up into the ceiling until the tabs on the side snap in place. Then insert the recessed light trim up onto the recessed light housing and attach this using screws or spring clips. Fasten the light switch to the electrical box with screws and attach the face plate. 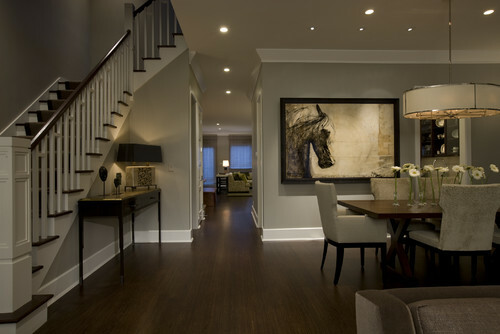 Your new recessed light is now ready. Switch the power back on and enjoy your new lighting!